It was a very bullish Christmas trading week for US equity indexes, with net weekly gains ranging from 3.5% (Trans), 2.8% (sp'500), to 2.5% (Dow, Nasdaq). 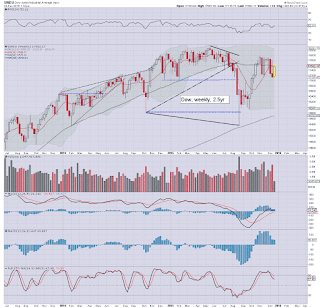 Near term outlook is bullish into mid/late January. 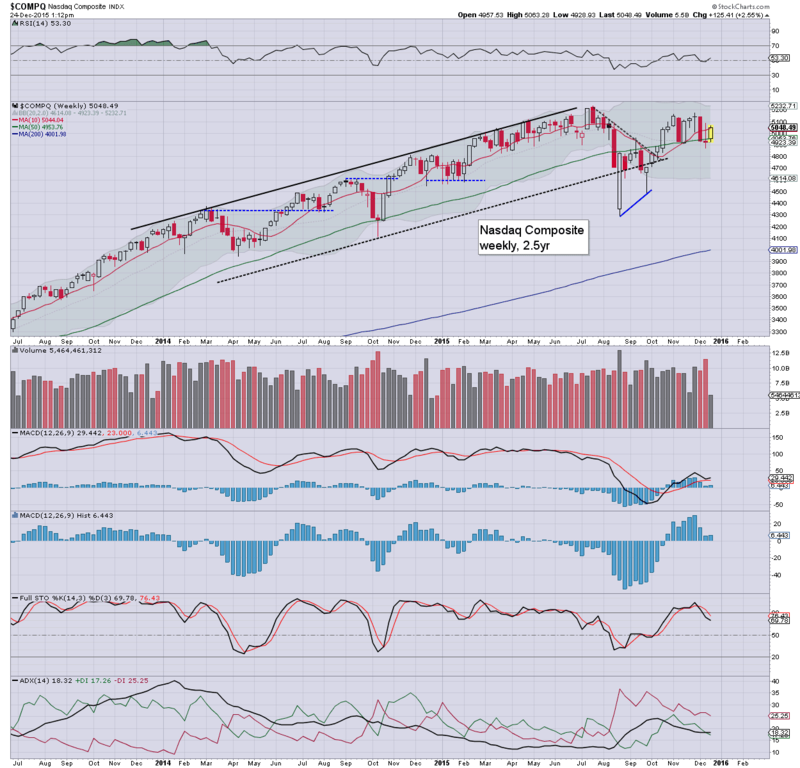 The core issue remains whether the market can break new historic highs in some indexes, and hold such gains. 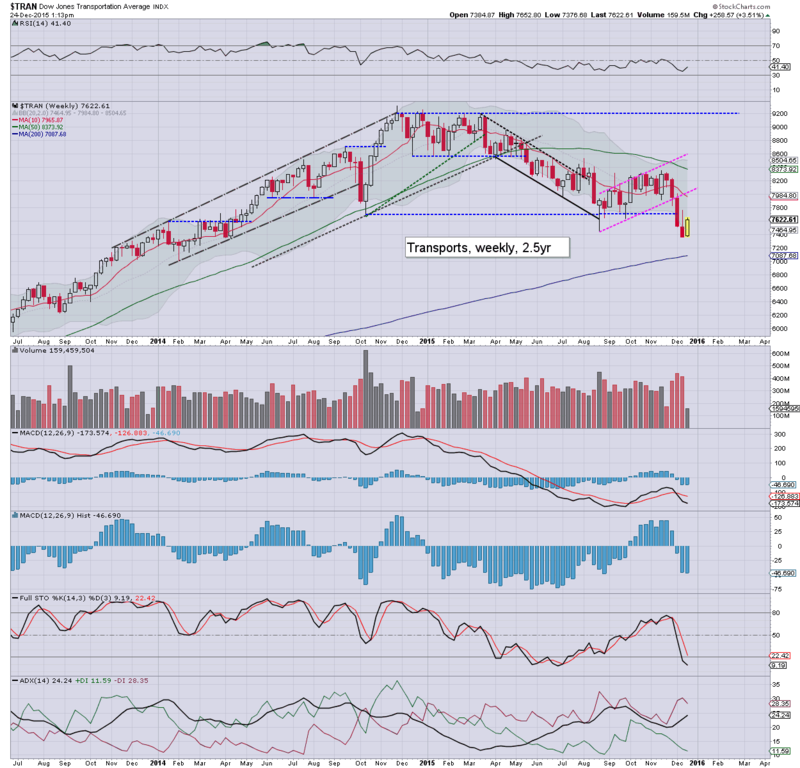 A rather powerful net weekly gain of 55pts (2.8%), settling at 2060. There is clear resistance at the FOMC high of 2076. A break above that high looks very probable next week, the only issue is whether the market will manage a year end close a little above... or below the 2100 threshold. Underlying MACD (blue bar histogram) cycle is starting to tick higher again, and in theory, there is viable upside of at least 2-3 weeks. Price structure is a giant bull flag stretching back to early November. 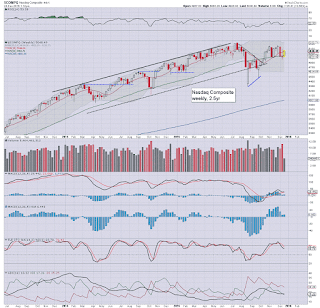 In theory, a weekly close >2116 would bode for new historic highs (>2134). Whether the market can hold such gains though.. that is an entirely different matter. 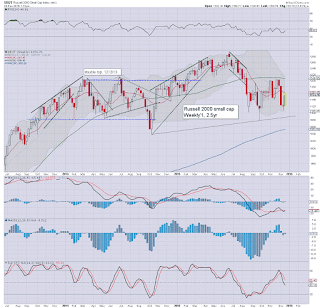 Best guess: the sp'2100s into early 2016, with follow through to the 2140/50 zone. There will be serious threat of a reversal though. 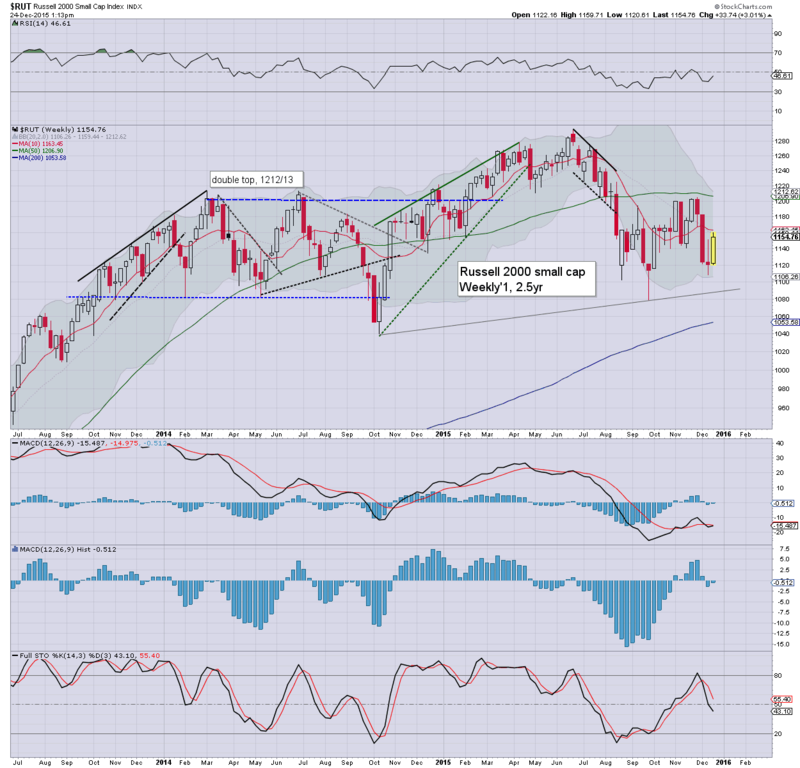 Any break <2000 in Feb/March would be a key warning that the Aug' low of 1867 is going to be tested. The tech gained 2.5%, with a notable close back above the psy' level of 5K. Like other indexes, broader price structure is a large bull flag. First target remains the July high of 5231. 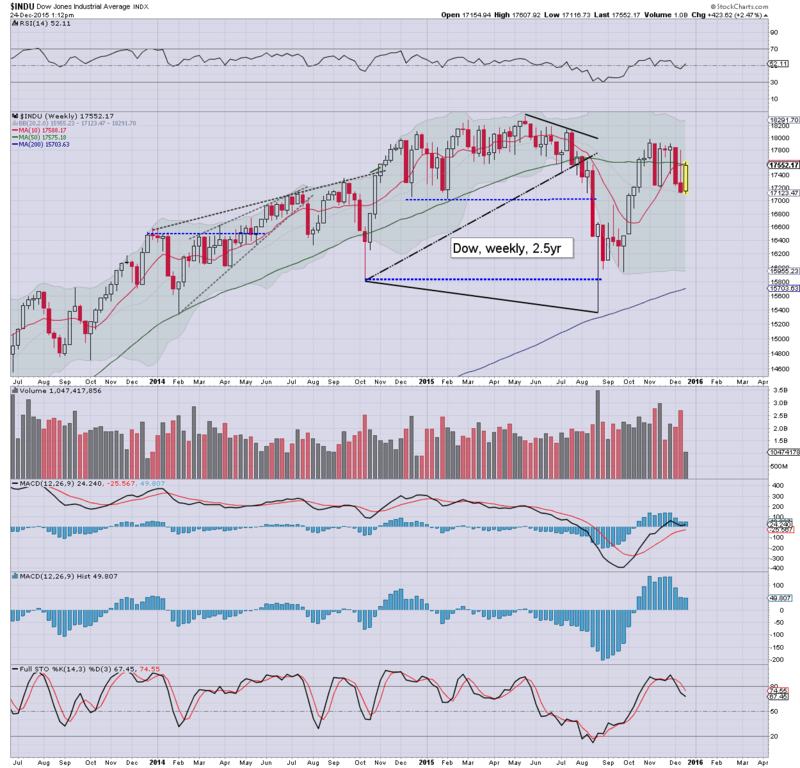 The mighty Dow saw a net weekly gain of 423pts (2.5%) in the 17500s. First target is the 18K threshold, and then the May high of 18351. 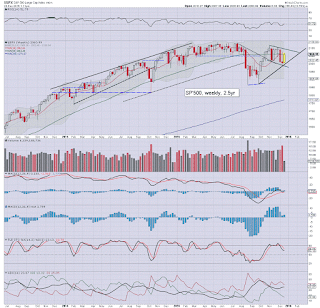 As things are, the weekly upper bollinger certainly offers the 18300s in the near term. The master index gained 2.9%, settling back above the big 10K threshold. 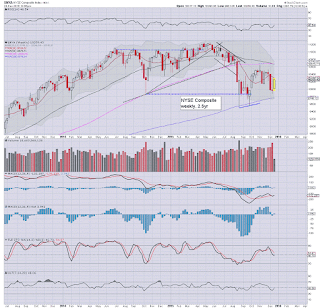 There looks to be viable upside to the 10600/700 zone in Jan/Feb. 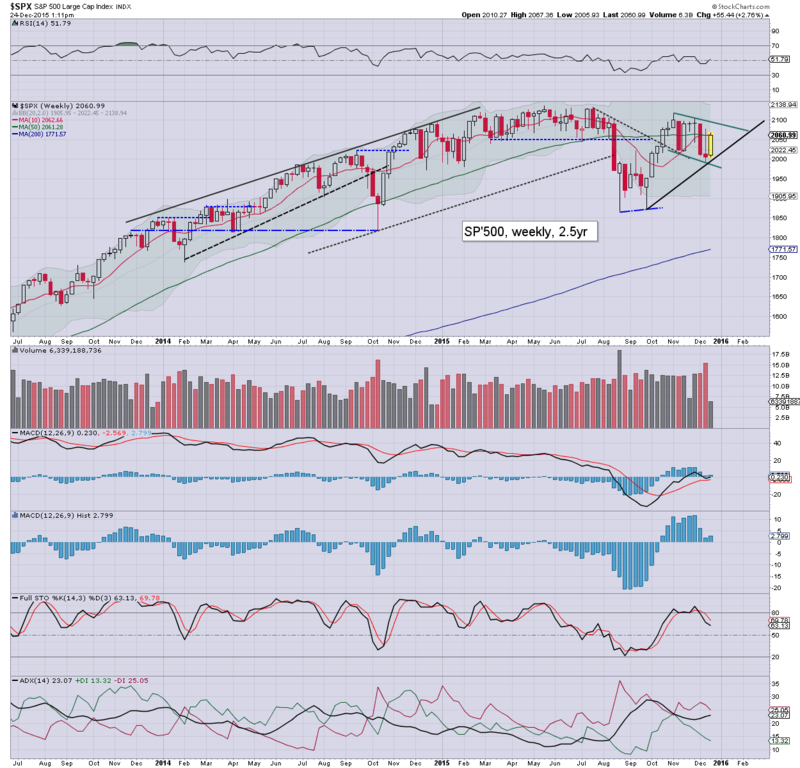 A sustained push into the 11000s looks difficult. The second market leader - R2K, settled +3.0% @ 1154. First target remains the 1200 threshold. New historic highs (>1296) look at least 3-4 months away. 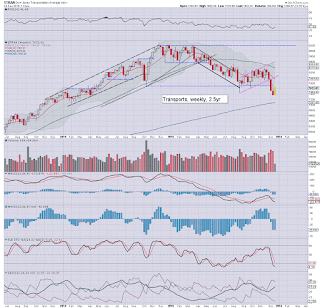 The 'old leader' - Trans, saw a net weekly gain for the first time in five weeks, settling +3.5% in the 7600s. First target is the 200 day MA - currently in the 8200s, a clear 8% higher. There is massive resistance around 8500/600, and that zone looks out of range for at least 6-7 weeks. Not surprisingly, it was a rather positive week for US equities. There was broad strength, and market mood was further improved as Oil powerfully rebounded by 6.4%. Arguably, the most important issue now is whether the market can break above the November highs. 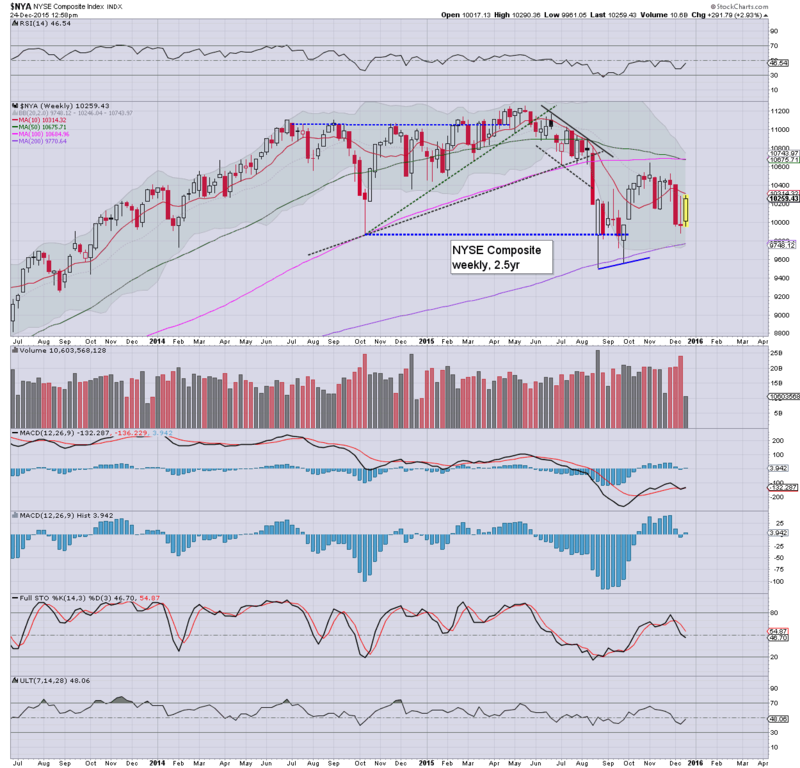 If so, there is high probability the headline indexes (sp'500, Dow, Nasdaq) will attain new historic highs. Whether the market will be able to keep pushing broadly higher, or sees a spring/summer rout.. that is the ultimate unknown. It will be another shortened holiday week, with Friday closed.